It wasn’t the prettiest game you’ll ever see, but UMD will take the result. 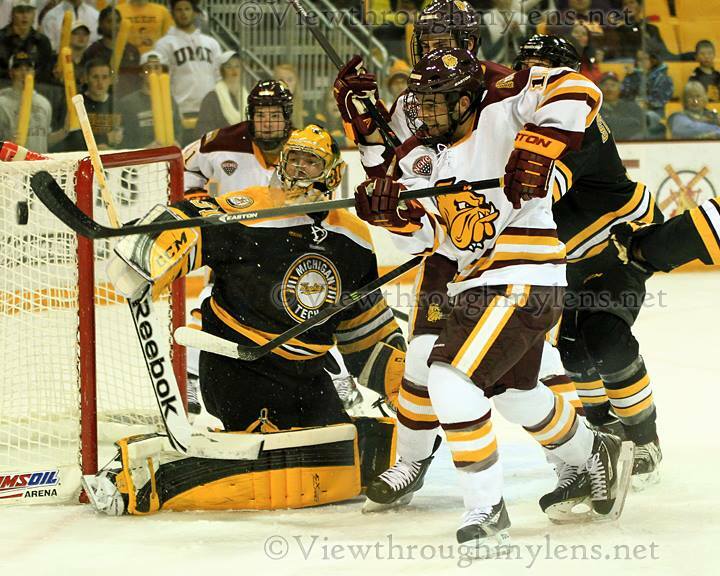 A late goal by Justin Crandall gave the Bulldogs a 2-1 win over long-time rival Michigan Tech at AMSOIL Arena on Friday night, allowing UMD to open the season with a win and boost its record against the Huskies to 11-1-2 in the last 14 games between the teams. The game-winner, which came from a bad angle, bounced off a Michigan Tech player and in. Good luck? Sure. But it just shows what happens when you put the puck on net and get bodies to the crease. Max Tardy was posted up at the edge of the blue paint, effectively distracting the Tech defender while Crandall gathered the puck, spun and put it toward the goal. If Tardy isn’t there, maybe that defenseman is able to get his stick on the puck and direct it to the corner. Who knows. Same thing on Tony Cameranesi’s goal. Get to the slot, get around the net and the puck will eventually get there, too. It helps that Austin Farley has great vision and Cameranesi has great hands, but you get the point. Another takeaway from Friday was the play of Matt McNeely. Although he only made 15 saves, his stop on a David Johnstone breakaway late in the third period — just seconds after the Huskies knotted the score with a shorthanded goal — clearly helped the Bulldogs retake the momentum and finish the period well.